You might wonder why I am titling a post "Forever Spring" when just about everyone has jumped on the fall bandwagon! Well, I kind of like to enjoy exactly where I am at the moment, and I'm just not ready for fall! We still have a few weeks before leaves start to change here in the mountains, then it will be over all too soon. I wanted to share a beautiful pattern by Johann Haviland called, "Forever Spring." One of the vocalists in my worship team brought me her beautiful set to use. Is that the nicest thing? I wanted to do a simple and elegant lunch table. 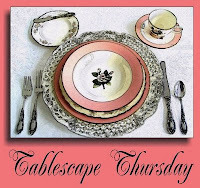 I'll be joining "Tablescape Thursday" at "Between Naps on the Porch" so be sure to stop by there. I did not use a tablecloth as I love the rustic look of the wood against the china and silver. 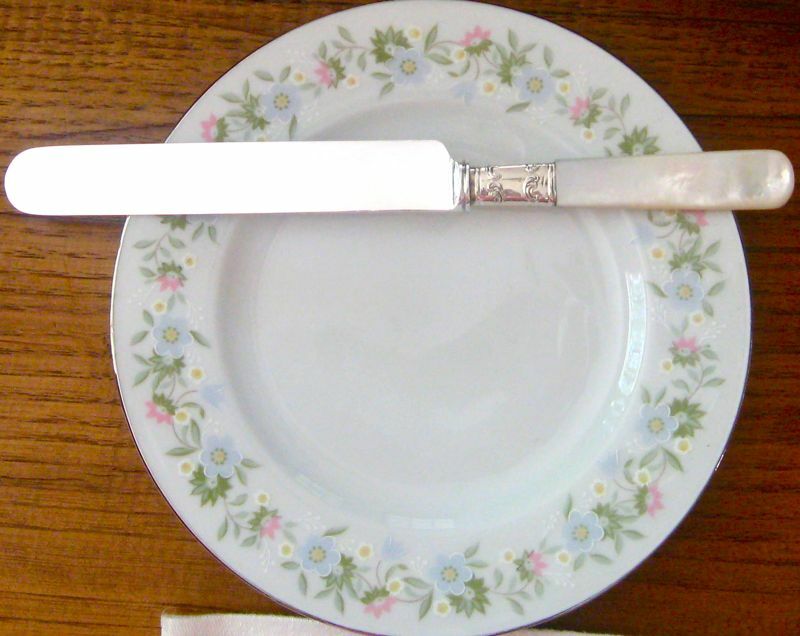 The butter knife is mother of pearl and sterling by Landers/Frary/Clark. The crystal stemware is "Longchamp" by Cristal D'Arques/Durand. 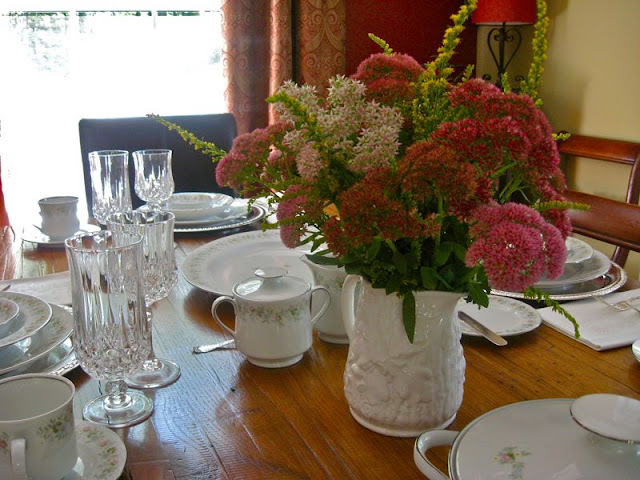 I went around the property and came up with this arrangement, which I put in a vintage Minton bone china pitcher. This table is for Beth with my thanks:-) My maternal grandmother also had this pattern, so it is very special to me. I don't ever remember her using it, though. She was an incredible woman who loved God first, and shared that love with everyone she met. She did not entertain with fine china and silver, nor did she have very many nice things. She always thought of others first. Her kitchen was always open and there was always something wonderful to eat. She entertained senators, congressmen, staffers, neighbors, family and anyone was always welcome. She delivered "Meals on Wheels" in her 60s. Her hand was always extended in Christian love. She was the woman Solomon talks about in Proverbs 31. She is certainly now getting the reward she earned here on earth. I tell you that to encourage all of you to give back in your community. I think we all have such access here with blogging, that we have a responsibility to use it for something greater than ourselves. Last week I posted about a wonderful program called "Blessings in a Backpack" that feeds hungry children here in America. How I wish that post had received as many comments as the Mikasa giveaway. Take what you have and give back. You will be so glad that you did:-) One person can make a huge difference! I love your silverware,this tablescape does make one want to hold on to Spring/Summer alittle longer! So pretty Anita! Reminds me of a Sunday lunch at my grandmother's. Love the flowers you found on the property, perfect! 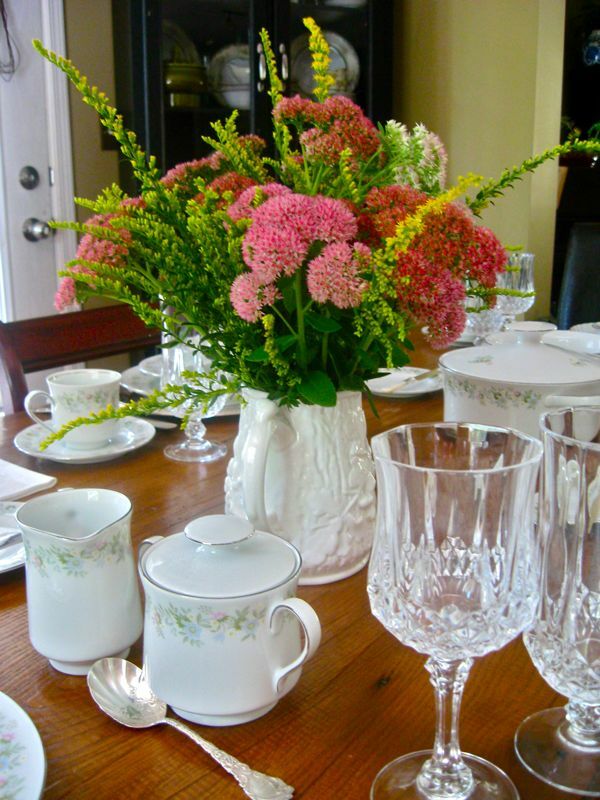 Beautiful china, crystal and silver and your spring bouquet. I think you have all the pretties here, Anita. Gorgeous table! Oh~ I wanted to mention that your grandmother sounds like an inspiring, remarkable woman! Hi Anita! I just love that your decorating instincts told you not use a tablecloth but to let the china shine against the wood tones! And that mother of pearl knife could not be more perfect with it! I also wanted to tell you how inspiring you have been to me in this blogging thing. I love how you have shared your heart and your faith without reservation and it has been an encouragement to me to do the same in my own blog! I want to share more of my heart rather than just my home. Thanks so much! Saw your meaningful posts and thanks for reminding us we are living in the greatest country and have always had generous giving spirits. We give and help with our two churches and hopefully will be able to continue for a long time. Thank you for sharing about the organization that sounds so great. Lovely table, Anita. 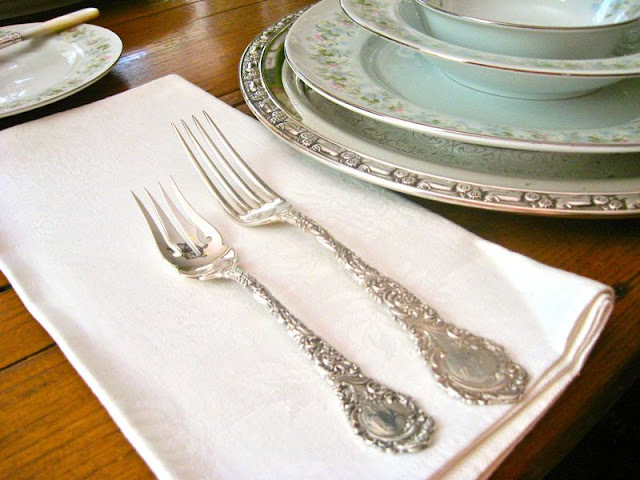 I like the simplicity of the overall presentation contrasting with the elegance of the heirloom sterling flatware. 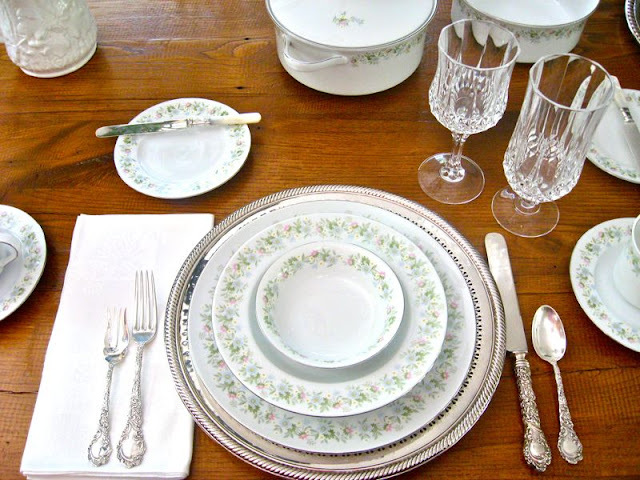 It was kind of your friend to allow you to share her pretty china with us. Loved the garden flowers. 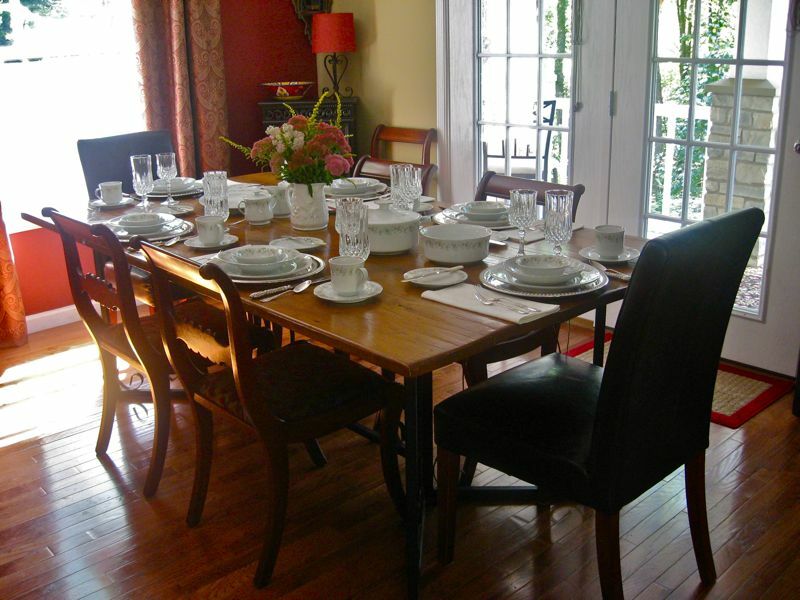 They always add warmth and charm to a well-laid table. Thank you for the reminder to give back. Well said. Today people live too fast, you have to enjoy what God has given us at their time you are correct. I have the same opinion as you. BEAUTIFUL table, I love it. Hurray for friends with beautiful china. I like the rustic look of the table too, very nice. The silverware is beautiful and the napkins are pristine. Everything is just lovely. Isn't it fun to play with other people's dishes? 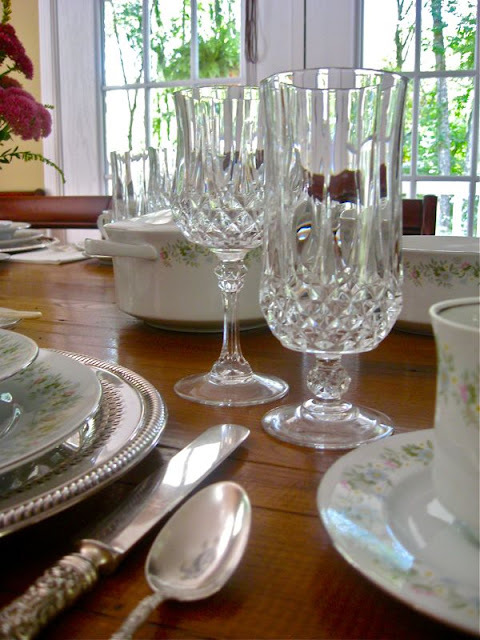 Your table looks so pretty with the delicate china pattern, sparkling crystal, and silver. I especially admire your ability to produce such a gorgeous centerpiece from your own property! So very pretty Anita. I love the flower centerpiece. I know with Fall, Mr. Winter is behind...I do not care for that part. OH MY GOSH, we are truly twins separated at birth! I am starting a list of all the things we share alike and do a post about it! And to think we have daughters named Miranda! I also googled the "1956 Brookpark pink hyacinth" melmac you mentioned and went wild! Anita, I have never seen that pattern! I was born in 1956, so I must make it my quest to own some pieces. I can't believe they designed a square pattern back then. Way cool! Oh, Anita!!! I love this table, and it's so "me" (at least the elegant me that lives inside my head.) I think the china and sterling and linen are all beautiful and agree that they look wonderful against the bare wood of the table. And on top of it, the music just puts me in the fine dining mood! What a special table with memories of your grandmother and the generousity of your church friend! I agree, the china is really showcased on the rustic wood of the table. And you still have flowers! Lovely. And the flatware, breathtaking. You know, the giving post reminds me of our children's heroes today. Reality stars with legal problems and sports figures who embarass themselves and others. It is too bad there isn't a "Caught Doing Good" award! Pretty is pretty in any season! Love showing the table! Lovely setting! What a beautiful tribute for a beautiful woman. I am absolutely in love with your silver. It would make any table a masterpiece. 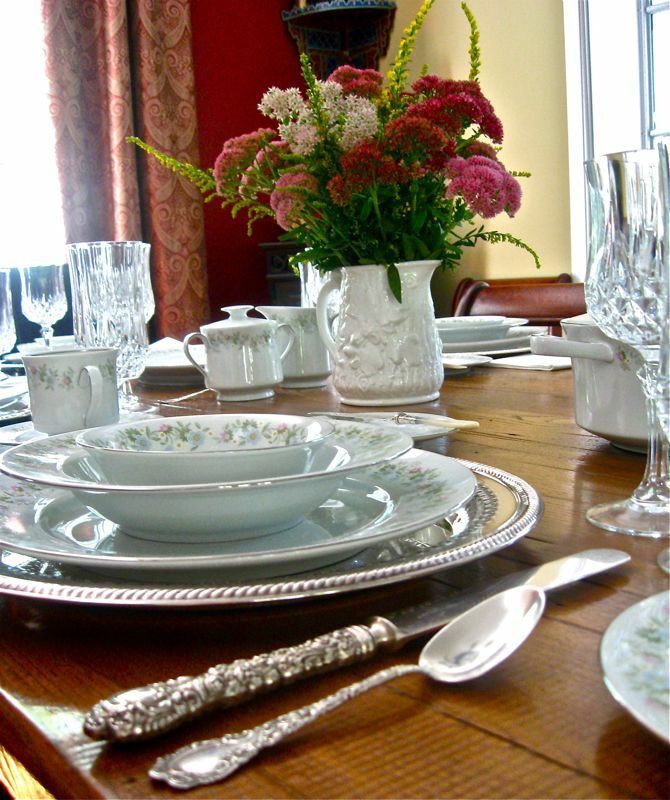 This is a lovely table: the combination of your valuable silver, the china, the beautiful crystal stemware and the antique napkins makes it unique. I'm also deeply impressed by your grandmother! With kindest regards from Europe! Anita, your blog truly shows that you think about what is good and lovely! You are inspiring in so many ways. A beautiful tablescape today, as always. I really love the ornate silver against the wood of your handmade, rustic table. The centerpiece is so pretty, too. Your table is beautiful!!! My grandson is called into the worship and music ministry and is attending Lee University majoring in Music with a Church emphasis. He's amazing. God bless you for what you do!! Beautiful china. I love your table setting on that rustic wooden table. So very beautiful. I love to come up with tables that remind me of loved family members. So wonderful. Anita, you are inspiring in many ways! God bless. 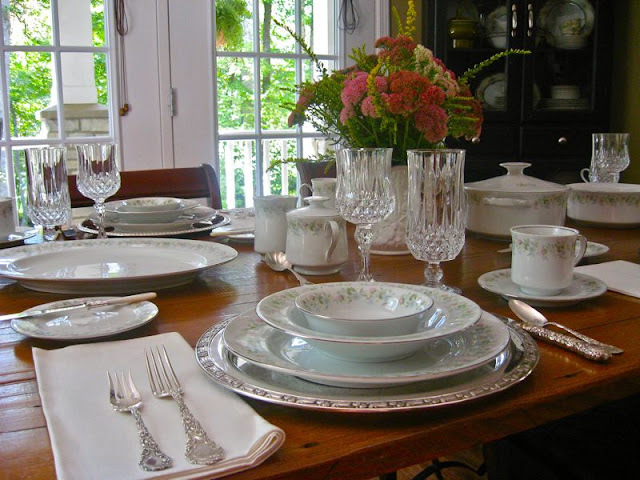 I love the simplicity of the wood with the crystal and beautiful china. I echo your plea for help for our underpriveleged communities and encourage you to read my post on "Matthew's Ground" to see poverty in my local area. (If you haven't already). Thanks for stopping by. 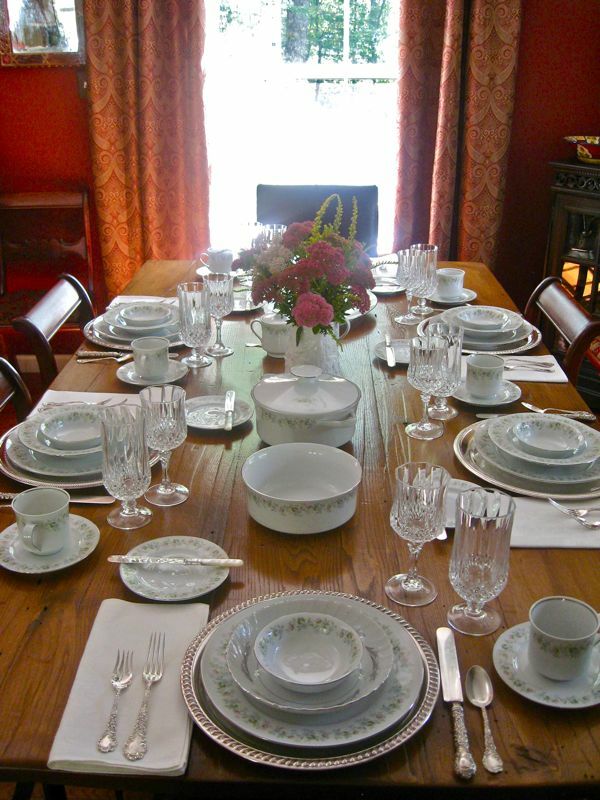 Your table is so elegant...the china pattern is so beautiful with all the sparkling crystal. Love the flowers, they look so nice in that pitcher. Oh, I hear you about saying goodbye to summer, lol. My son says authumn is here and summer's over, I say we've got a few more good days left. Today was just such a day :o) Praise the Lord! Beautiful table as usual, very pretty service. This is classic elegance at its best! Gorgeous! 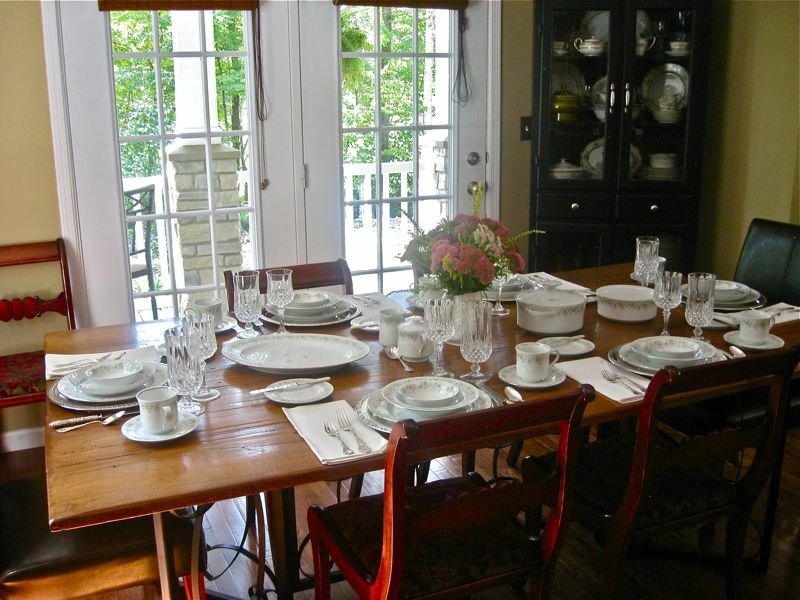 Your tablescape ...and entire home as a matter of fact... looks so light, airy and peaceful. Anita, you are always an inspiration. I really love the beautiful china and silver on a bare table. It creates a different feel and I just love it. Those silver chargers are, I think, the most beautiful that I have seen. Such lovely china too. How wonderful that your friend brought this for you to use. 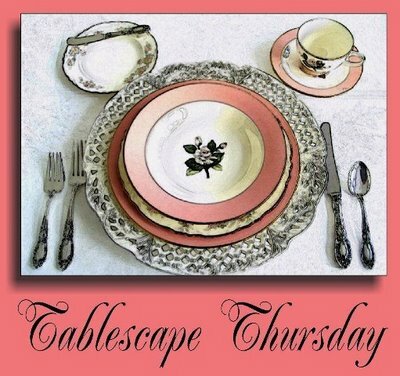 Thank you for sharing a not Fall tablescape! I am hanging on to summer as long as I can. Your table is beautiful! I love your Grandmother and I don't even know her! She reminds us to be a Proverb 31 women! I think we get so caught up in worldly life we forget we are here to serve Christ! Him only! 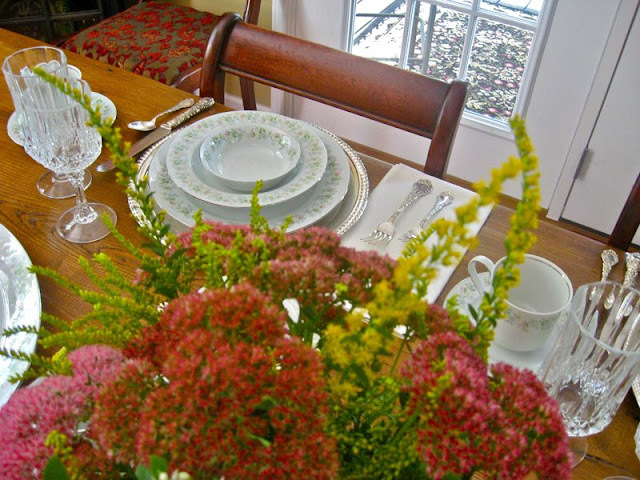 Thank you for sharing your wonderful tablescape but also your memories of your wonderful Grandmother.